German Field Marshal. Led a number of Air Fleets in the early part of World War II. Theatre commander in North Africa and Italy. Albert Kesselring served in the German army during World War I. 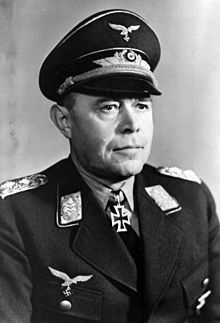 He transferred to Luftwaffe in 1933 and in 1936 he became chief of the Luftwaffe general staff. During the first years of World War II, Kesselring commanded a number of Luftlottes or Air Fleets including: Luftlotte 1 during the Polish Campaign; and Luftlotte 2 during the French Campaign and the Battle of Britain. After 1941, his duties were expanded to include command of both land and air forces. First, he was appointed commander-in-chief in the Mediterranean where he eventually supervised the evacuation of Tunisia in May, 1943. Then he was appointed commander-in-chief of Italy and of Army Group C in late 1943. During the next year he managed a highly successful defensive campaign in Italy until he was seriously wounded when his staff car collided with a heavy gun in transit. He returned briefly to command in the closing months of the war. He was captured and sentenced to death based on war crimes (the massacre of 320 Italian prisoners). His sentence was commuted to life. He was eventually released in 1952 because of health reasons. He died in 1960.